Peter Higgs has been announced as the joint winner of the 2013 Nobel Prize for Physics (shared with Francois Englert). We take a look at the man behind the prize. 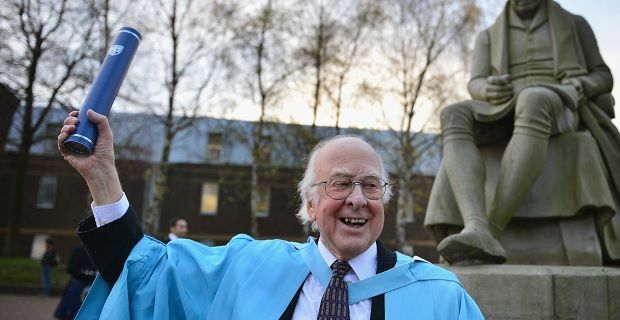 Peter Higgs was born in Newcastle upon Tyne in 1929. He is a British Theoretical Physicist and now Nobel Prize winner. You don’t win Nobel Prizes in Physics without a solid educational background. However Higgs’ educational beginnings were mostly at home due to his family moving around with his father’s job. He did eventually attend Cotham Grammar School before going on to City of London School and specialising in Mathematics. His early childhood education did not hamper him in any way and he went on to great academic achievement obtaining a first class honours degree in Physics before obtaining a Master’s degree in King’s College London and finally with a thesis entitled 'Some problems in the theory of molecular vibrations' he gained his PhD. Of course it is his research work that gained him the place in the Physics history books. Higgs began his career as a Senior Research Fellow in University of Edinburgh. He went on to hold a number of positions in London before returning to Edinburgh to take up a lecturing position at the Tait Institute of Mathematical Physics. He became a Fellow of the Royal Society of Edinburgh ad also of the Institute of Physics. He retired in 1996 and became Emeritus Professor at University of Edinburgh. During his time in Edinburgh, and basing his work on the work of Japanese Nobel Prize laureate Yoichiro Nambu, Higgs studied mass and developed a theory that proposed how the building blocks of the universe have mass. The Higgs field and Higgs mechanism were developed as a result of his theory. A new “spin-zero” boson was predicated (known as the Higgs boson). By 1964 a number of other Physicists (including his co-winner Francois Englert) also made similar conclusions of their work. Last year, at the famous Large Hadron Collider at CERN, experiments showed the likely existence of the Higgs boson – a massive breakthrough for Peter Higgs who had visited CERN. The particle has been nicked named God’s particle, although this is disliked by Peter Higgs as an atheist. The announcement of his Nobel prize, "for the theoretical discovery of a mechanism that contributes to our understanding of the origin of mass of subatomic particles, and which recently was confirmed through the discovery of the predicted fundamental particle, by the ATLAS and CMS experiments at CERN’s Large Hadron Collider", was made on 8th October. The Nobel Prize for Medicine was announced the previous day. As a big fan of the TV programme The Simpsons, he is not likely to get much time to watch many episodes as he will be in huge demand for appearances in the coming weeks and months.